Once again, the video demonstrates the utter folly of engineering bike lanes between street parking and moving traffic on a busy street. No amount of driver training is going to fix this entirely. There are always going to be cars swerving obliviously into and out of the bike lane. There will always be doors flung open. Double parked cars will always block the lanes. In fact, Long has an entire video channel dedicated to that bit of futility. As to enforcement, everyone’s seen police officers roll right past cars and trucks parked on bike lanes. And on those rare occasions when there aren’t regular trucks and cars in the bike lanes, the enforcers themselves block them. 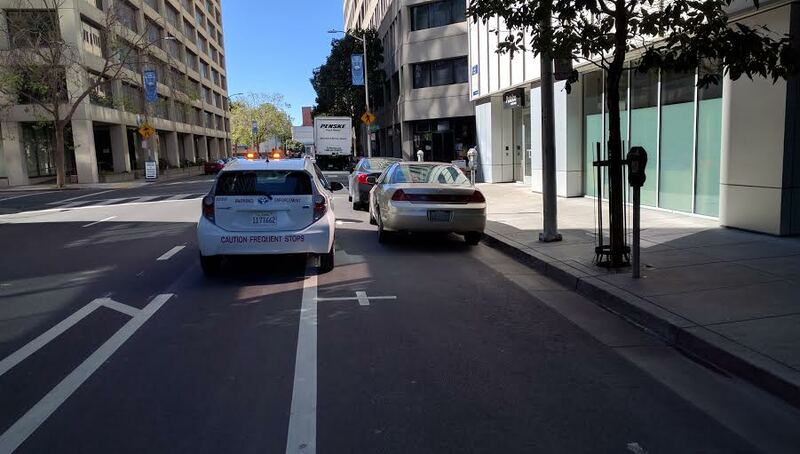 Oakland “Parking Enforcement” blocking the Webster Street bike lane right in front of an open spot. Image: Streetsblog. There’s no way around it: door zone lanes don’t work and are a natural collision generator. That’s probably why Bay Area advocates and pro-bike politicians are trying to move in NACTO guidelines to get cities building more protected bike lanes, also known as cycle tracks, where cyclists are physically protected from cars intruding into their space, either by curbs, planters, parked cars, bollards, or whatever. In other words, if it’s not a protected bike lane, it’s not a bike lane. San Francisco is moving in the protected-bike-lane direction. Projects on Market, Masonic, 2nd, and Fell are either on the ground or soon will be, albeit often with compromises or significant pushback about parking issues. But the incident Long witnessed harbors back to a Streetsblog piece about Mission Street’s new bus lanes that ran exactly one week ago. Advocates and city officials interviewed for the story opined that Mission doesn’t have enough room for proper bike lanes and therefore cyclists should ride on Valencia. Some commenters reflected this notion. Long’s video shows its fallacy. The Dutch and other nations figured out how to do this a generation ago. There’s no mystery here. It’s just about priorities. Well said. And thanks for making this video and looking out for your fellow vulnerable road users. This is why the various compromises that were made on the Polk Street design are so bitter to take. Like Valencia Street, that area is also a commercial stretch. And like Valencia Street, it is the only good route that can be used to travel north-south through the city on a bicycle. As a result, there are significant competing demands on the space, including the need for people to pull over to pick up and drop off passengers from rideshare and taxi services. Not to mention rampant double parking. It a public health travesty that after all the crash and injury data that the city has collected on Valencia Street the SFMTA and DPW haven’t used that information to make better decisions about the need to add protected lanes to similar locations. I’m not sure I’d agree that Valencia is the ONLY good route to take on a bike. You made that point about Masonic the other day and I can see the logic there. But Valencia has a bunch of parallel N-S streets that can be used between there and Potrero, a couple of which even have bike lanes. West of there is trickier, I’d concede. Likewise there are through streets parallel to Polk. I’d argue that the best streets for bikes are not super busy commercial streets. In much the same way as I see a lot of bikes using Page even though there is a bike lane on adjacent Oak Street. More specifically, I think the problem with Valencia, other than the huge amount of set down/pick up traffic, is the width. When the bike lanes were put in, Valencia went from 4 lanes to 3 (and really 2 when the center turn is used for parking). Put in some form of “protection” like planter boxes or bollards and you’d probably lose another lane. And it is very much part of SFMTA’s job to ensure throughput as well as safety. It’s a trade-off. So many bugbears in this video. SFFD responds to a minor injury in an enormous galactic cruiser. Google Bus ambles by in the background. Fixies. Parking. Go back to the story about self-driving cars and livable streets. The number one enemy of livable streets is parking. Remove the need for parking and we upgrade everything. There is only Folsom and Harrison that are good for bicyclists and those are 3 and 4 blocks away,respectively. Are you proposing that bicyclists go 6 or 8 blocks out of their way while we make sure motorists can park within a block or so of their destination? Not necessarily. Get rid of the useless middle lane that is nothing but free double parking (never enforced, just like the double parking in the bike lanes), and you can also get rid of at least one side of street parking. That would create enough space for protected bike lanes and neither of these will affect “throughput”. However, I disagree that “throughput” on Valencia should be a priority when you have Guerrero and S Van Ness nearby. The idea that streets should prioritize “throughput” at the expense of basic safety, especially for the most vulnerable road users, is highly anachronistic. That is why the City finally tossed out LOS. If you want to get to throughput, what about throughput of bicyclists? Or pedestrians? Why does only the throughput of cars matter, especially when they are so dangerous? Great article. Glad to see SF Streetsblog taking a strong stance on this given the absurdity of the City saying, on one hand, that they are all about Vision Zero and then, on the other hand, doing absolutely zero enforcement of dangerous and blatant motorist violations let along creating safe bicycle infra on Valencia. And it’s been like this for many years, not just a few months or even a couple of years. The fact that SFPD has a station right smack in the middle of Valencia and does exactly zero enforcement of motorist violations of the bike lane is a huge “eff you” to all bicyclists in this city. This fact alone makes SFPD’s incredible windshield bias very apparent. I wish the woman who was hit would drop by and let us know the outcome. Was she truly okay (sometimes injuries manifest later when the adrenaline wears off)? Also, was the motorist given a ticket? Per usual, I’m guessing not since the cops didn’t even want to look at Long’s video which, although it didn’t show the actual collision, made it super clear (good enough for a jury I’m sure) who was at fault. I’m guessing they called it an “unfortunate accident” and the motorist suffered zero repercussions for driving a 2-ton vehicle right next to a bike lane on a crowded pedestrian street without checking for bicyclists before crossing across the bike lane. That should be a steep ticket and a loss of license for at least a few months, as well as training afterwards on how to drive around pedestrians and bicyclists in a dense city. But since SFPD is on it, I wouldn’t be surprised if they found a way to blame the bicyclist. She *was* wearing a helmet, so, you know, I guess they can’t blame it on that …. I honestly cannot understand why the City doesn’t remove that useless middle lane which is used for double parking and use the extra width to create protected bike lanes. The travel lanes can also be narrowed. Just seems like such an obvious “showcase” street for the City to show it’s commitment to treating bicyclists like regular citizens instead of second-class ones. Thank you for stating this absolute, which should go without saying and is still not the policy for all new lanes everywhere. “There is only Folsom and Harrison that are good for bicyclists”. What about the much quieter mid-block streets like Treat, Shotwell and Capp? They may not all go all the way through but between them they get you most of the way. Depends where you are going from and to. If your trip is Valencia and 14th to Valencia and 26th, then you have a point. But from the Best Buy/Rainbow/16th and Bryant shopping area to Bernal Heights? A combination of Treat, Shotwell and Capp, with the quieter odd-numbered streets, gets you there without touching Valencia. You mean the turning lane? With that gone you’d have traffic constantly backed-up behind left-turning traffic. How would more congestion and frustration be safer for cyclists? Now there I’d agree with you. “Vision Zero” is just a political slogan. The political reality is that the kind of restrictions and enforcement it would take to genuinely have zero accidents would be so invasive and stringent that the voters would not stand for it. If the sole priority for SFMTA was safety then there are all kinds of things they would do differently. But they also have a mandate to “keep the traffic moving” because that is considered both an economic imperative and a voter demand. Which leads to the unfortunate conclusion that there is an unspoken number of accidents and injuries that are considered to be acceptable, even while the “Zero” number gets bandied about liberally. Valencia as-is perfectly represents that kind of compromise thinking. Cyclists don’t like it, drivers don’t like it, pedestrians don’t like it, the residents don’t like it, and the prevailing message is that nobody gets everything they want. Even three ft buffer is too short because car doors extend about a foot past the three ft buffer on JFK in GG Park. He’s the only person on here who makes any sense. Call it what it is: subsidized parking. Use of public property to store private property “for free” is a government subsidy. Thanks, and I think it’s sad that, when presented with arguments and evidence that run counter to his own personal and subjective preferences, murphstahoe responds by seeking to shut out those opinions rather than engage the points made. And perhaps more importantly, if he cannot win these debates here then how can he hope to influence the majority of voters in this city who, I guarantee him, think more like I do than like he does? A safer infrastructure will be achieved by listening empathetically, building bridges, forming coalitions and alliances, accepting compromises and by embracing diverse viewpoints. It won’t be achieved by sticking your fingers in your ears and repeating “I’m not listening” like a toddler having a tantrum. Nor by demonizing entire classes of residents. I hope he does not give up engaging the topic. The next block in the bottom photo is awful. In the AM and PM there are always people double parked in front of the PG&E building. A curbside passenger loading zone with extra enforcement would do wonders. Doubt that Oakland would get that proactive. Can’t wait for the protected lanes on Telegraph Ave. Honestly, as someone from Canada the most shocking thing in this video is the “shall I call an ambulance”…”no its too expensive” exchange. As someone who grew up with social healthcare, the idea that someone wouldn’t seek medical attention for financial reasons is…there really are no words for it. And yes, does the fire department really need fire trucks the size of small moons to respond to these types of events. The comment actually makes no sense at all, particularly to those of us who have been biking here even when Valencia was a traffic sewer just like Guerrero. No evidence was actually presented. I’m not comparing the two routes, I’m making the point that if we don’t insist on high quality design, we don’t get it. It “didn’t make sense” to you because I never said what you claimed, i.e. that Valencia street was safer 20 years ago. What I said was that the proposed changes to Valencia are significantly flawed, and explained why. I think you are confusing “doesn’t make sense” with “I personally disagree”. And no evidence? I made statements and explanations. As I feel sure you know, statements are evidence – in court it is called testimony. In any event, nobody can produce evidence for or against a hypothetical notion. This is really a values issue and not a data issue, because it is a political question – what is the price of zero accidents and are the voters willing to pay it? Totally agree! here in Argentina maybe not the best but if I see something like this, I just call an ambulance without asking. I’ve gone home with broken bones before because of the cost. But we have to be independent in this country. Have to keep the american spirit. Can’t let the evil socialism win. The Netherlands is so close to gaining another citizen. Oh, I’ve got one! An AirZound. Very loud. It will feature in the next Cars out of Bike Lanes video! Call it what it is: subsidized storage of private vehicles on public land. Free? It is paid for out of taxes, including the extra taxes that vehicle owners pay. So it’s not free – merely funded collectively. There is little point in building roads for vehicles to travel on and then not provide space for those vehicles to stop. So the design of most roads and streets includes additional width to enable vehicles to stop safely without obstructing other traffic. And that means either off-street parking, such as you routinely see in the suburbs and smaller towns. Or an extra lane at the side to enable vehicles to pull over at their destination. Where demand for such “storage” exceeds demand then a charge can be made via meters. Or who can park there can be restricted. But even in a crowded place like SF there is no opportunity to charge for street parking in much of the city. And any attempt to charge for parking on a near empty street would clearly fail. > It is paid for out of taxes, including the extra taxes that vehicle owners pay. So it’s not free – merely funded collectively. Actually, mostly from general fund taxes, motor vehicle taxes don’t even come close to covering the public costs to support motor vehicles. And these taxes could be better spent subsidizing other taxpayer needs, such as subsidy funding of mass transit. Automobile owners are by nature wealthy enough to buy their car and insurance, and it doesn’t make sense to me to give general fund preference to a wealthy class. In my neighborhood, there is very little empty on street parking. Snatched up quickly, just as you would expect with a give-away program of something valuable. There would be easy opportunity to charge market rate prices for parking by selling MTA on street parking permits. The price could be adjusted in response to demand, just high enough that we start to see vacant spaces. That may well be true. But how roads get funded is fairly consistent across the nation so it’s reasonable to assume that is what the voters want. Anyway the point here was specifically about the cost of on-street parking. And given that most roads were designed and built to be wide enough to allow that, the incremental cost of providing that parking is fairly low. I’m also not sure I’d agree that “auto owners are by nature wealthy”. In rural and suburban areas car ownership rates are over 90%, so clearly most poor people have a car. While in San Francisco, the more expensive housing is closer in with less need of a car. It’s the poor in Daly City or Martinez or Novato who have the most need of a car. Finally your point that parking in SF is “snatched up quickly” depends on where in the city you are talking about. In the crowded north-east parts, sure, and that is why it is metered. But the further south or west you go, the easier street parking becomes. The market value of street parking space in Excelsior is probably as close to zero as can be measured. I agree that parking pricing can and should be adjusted according to variable demand, where that is viable. But isn’t that the whole point of SFPark?